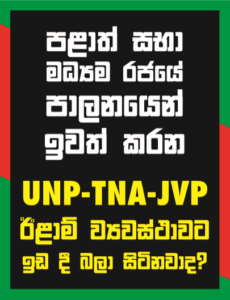 Chairman of Federation of National Organisations and President of the Patriotic National Movement Dr. Gunadasa Amarasekera yesterday said that the UNP, the UPFA, the JVP and the People’s Movement for a Just Society leader Ven. Maduluwawe Sobhitha Thera reveal their positions on TNA leader R. Sambandan’s recent statement that his party wanted federalism. Whom to unite and how? Former President Mahinda Rajapaksa in an interview with The Nation said that he would work aggressively to restore faith in institutions related to law and order if his party is voted to power. He spoke confidently of his chances and said he relishes the prospect of going head to head with Ranil Wickremesinghe, who he claims had been using proxies for many years instead of facing him directly. The following are excerpts of the interview held in his home in Medamulana. The untimely death of West Australian Federal Liberal MP Don Randall is a great shock to us all and has sadness to all. Don was a decent and a genial person who always gave a listening ear to others, and was much loved by Australians of Sri Lankan origin. Don was the Chair of the Sri Lanka Australia Parliamentary Friendship Group from its inception and swapped the position with Labor Senator Steve Hutchins to become the Deputy for short periods. Both statesmen became truly great friends of Sri Lanka in her time of greatest need. Don always stood up in Parliament to put the record straight whenever an issue related to Sri Lanka arose.